SOE rolls out 4 "MegaServers" to make sure that DC Universe players don't have to wait long to group up. Usually when an MMO company announces a server merger, it means that the population has shrunk so much that the cities and gathering places feel empty and dead, especially when compared to the ebullience of launch day. DCUO enjoyed a certain buzz and success when it launched back in January, but even the news of adding Green Lantern powers soon hasn't kept players logged in. (I logged in last week, Gotham was indeed dead on my server.) But instead of just closing down servers to shift the population around, Sony Online Entertainment is instead opening four "MegaServers" that will use phasing technology to keep each hero and villain in a manageable world area while allowing you to quickly queue for battlegrounds and alerts (dungeons). The MegaServer transfer has already begun and will complete next Monday August 15th. The four new MegaServers will be based on region and platform: US PC, US PS3, EU PC and EU PS3. Followers of WoW will be familiar with what phasing means, but it's basically a way for players on the same "server" or "shard" being able to see different scenery, PCs or mobs based on what phase they are in. All the players in one of the MegaServers will use the same auction house and queue in the same battlegrounds and Alerts, but might not see every player when cruising through Metropolis. You will see much larger populations! You will have a much larger pool of people to join in Alerts, Duos, Raids, Legends PvP, etc. It will be much easier to play with friends who were previously on other servers (plus lots of new friends to make). You will be able to switch between PvP and PvE style play by using the phase shifters in the Hall of Doom and JLA Watchtower. There will be a larger number of items in the Broker [Auction House]. One thing that is quite novel for an MMO is the ability to switch between PvE and PvP play on the fly. SOE implemented this as a way to combine the two different rulesets into the same server structure, but I think it's a feature that many MMOs might consider. Sometimes you want to stalk the streets of Metropolis looking to stop low-level Villains or participate in open world PvP, while there are times that you might just want to quest away without looking over your shoulder. There will be algorithms in place to make sure that you play in the same phase as players in your League [Guild] and on your Friends list. 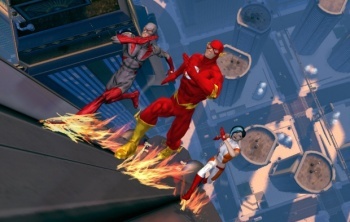 While the ability to queue multiple servers-worth of players in dungeons is a plus, and switching between PvP and PvE on the fly is a cool feature, it's hard not to interpret the MegaServer merger as anything other than harbinger of doom for DCUO. I still have hope that the game will continue for a long time - it's really quite fun - but I'm not positive that it has enough gumption to last as long as, say, Star Wars Galaxies did. For a full list of what servers will be pressed into which MegaServer, head over to dcuniverseonline.com for more information.